We’d love your help. Let us know what’s wrong with this preview of Greece by Roderick Beaton. We think we know ancient Greece, the civilisation that shares the same name and gave us just about everything that defines 'western' culture today, in the arts, sciences, social sciences and politics. Yet, as Greece has been brought under repeated scrutiny during the financial crises that have convulsed the country since 2010, worldwide coverage has revealed just how poorl We think we know ancient Greece, the civilisation that shares the same name and gave us just about everything that defines 'western' culture today, in the arts, sciences, social sciences and politics. Yet, as Greece has been brought under repeated scrutiny during the financial crises that have convulsed the country since 2010, worldwide coverage has revealed just how poorly we grasp the modern nation. This book sets out to understand the modern Greeks on their own terms. To ask other readers questions about Greece, please sign up. Not so much a page turner as a thorough and informative account of Greece from Ottoman occupation to today and with more wide-reaching thoughts about what Greece is: nation, state or nation-state? I learnt masses from this. Year 2021 will mark 200 years since my country declared its independence from the Ottoman Empire. I’ll be very surprised if between now and then (or, indeed, ever!) anybody manages to produce a finer tribute to modern Greece than this concise, loving and balanced account. In what must be the shortest 400 pages I’ve read in a long time, professor Roderick Beaton takes you from the first stirrings of independence all the way to the farce / tragedy of the current crisis, always with an eye to both w Year 2021 will mark 200 years since my country declared its independence from the Ottoman Empire. I’ll be very surprised if between now and then (or, indeed, ever!) anybody manages to produce a finer tribute to modern Greece than this concise, loving and balanced account. In what must be the shortest 400 pages I’ve read in a long time, professor Roderick Beaton takes you from the first stirrings of independence all the way to the farce / tragedy of the current crisis, always with an eye to both what’s remained constant and to what distinguishes the various phases of this historical progression from one another. So you’re never allowed to forget that Greece was carved out of a side of a larger empire by its protectors in London, Paris and Moscow, or of the fact that one head of the Byzantine eagle points east and the other west (my analogy, not the author’s), but you’re also steered through the rise and fall of the importance of the military (originally established by Otto's Bavarians), the rise and fall of “the Great Idea,” and the change of the grand divide among Greeks from royalist vs. liberal, to communist vs. right-wing. 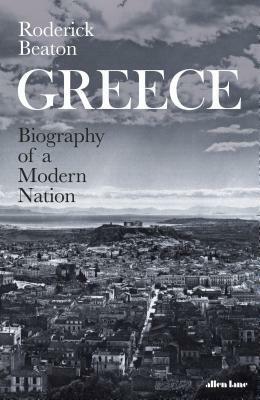 Additionally, the author addresses the many interpretations of what it’s meant to be Greek over the past 250 years and how that has been relevant to the modern history of the country. Inevitably, this is also the story of the leaders of the revolution, the state, its expansion, its divisions and its eventual maturing into a modern and vibrant democracy. My family moved to Greece in 1971. I was only 5 when my grandpa led the family council on how to vote on the 1973 referendum about the King and I remember it like it was yesterday. I have equally vivid memories of the uprising at the Polytechnic school, the annual demonstrations in front of the US Embassy, the rise to power of PASOK and the creation of a leviathan of a state which no government since has had an inclination to curb. So I thought I knew my country, but this book has made me understand that I was lucky enough to actually experience the most peaceful and balanced and democratic period of the whole two centuries. I do have my criticisms, of course: Melina Merkouri gets mentioned here more times than Constantine Karamanlis, for example. It is he, rather than Venizelos, who is the most important Greek politician of the 20th century, in my view. But that’s just my angle, and this is one of the best books I’ve read on any topic.